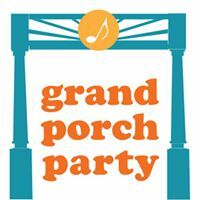 This year we are pleased to be partnered with the Grand Porch Party (GPP) in Uptown Waterloo. The Grand Porch Party is a free music festival held on the front porches of homes in Uptown West Waterloo. If you can get down a sidewalk, you can attend this free, fabulous event. Entirely community-made, the GPP is an afternoon of awesomeness held each year from 2pm to 5pm on the second Sunday in June (this year June 10th) — which is Canadian Rivers Day! Canadian Rivers Day aims to promote public awareness around the heritage and health of Canadian Rivers which are essential to the water supply of all Canadians. In partnership with the GPP our goal at this event is to raise $2,500 for our upcoming First Nations Water Project within the community of Pikangikum in Northern Ontario. Pikangikum is a remote Ojibway community in Northern Ontario which can only be accessed by winter roads or by aircraft. It has over 800 school aged children and has the unfortunate distinction of being the (per capita) suicide capital of the world. Over 100 suicides involving youth have occurred over the past 20 years with 5 of these occurring in July last summer. Suicide rates are the result of extreme poverty and inadequate living conditions within the community. The population of this community is approximately equal to the population of the Uptown Waterloo West Neighborhood who is hosting this years GPP. Taps at seven cisterns located in the community are used to collect clean water for bathing, cooking, drinking and sanitation. These taps can be found kilometers from the homes they service, which is particularly challenging in winter when temperatures can be as low as -400C. In some instances, untreated water from the river is used for household needs instead of walking to a cistern. Homes within this community were not designed with bathrooms and as such people are forced to bathe using buckets and utilize outhouses. This project strives to instill dignity in the lives of youth by providing them the basic right of water and sanitation in the places they will gather in community; the baseball diamond, the arena, and the Youth Centre. This will provide them with community spaces for outreach and mental health programs. Using holding tanks or additional cisterns, Chief Dean Owen, and project partners will work to recognize Youth as future leaders by providing them with this basic human right.